QA Graphics BAS Symbol Library v5 has been nominated as a finalist for the 2017 Consulting-Specifying Engineer’s Product of the Year Award in the Software: Design, Modeling, Analysis category. 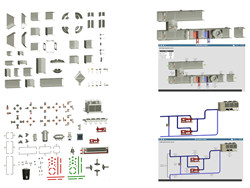 The Symbol Library v5 includes a variety of graphics and animations needed to construct building automation system graphics and HVAC graphics or MEP equipment. "We are excited that our new symbol library is being recognized as an innovative product. We are always looking to raise the standard in our industry,” said Dan McCarty, owner of QA Graphics, when asked about the nomination. QA Graphics BAS Symbol Library v5 has been nominated as a finalist for the 2017 Consulting-Specifying Engineer’s Product of the Year Award in the Software: Design, Modeling, Analysis category. This is a premier award for new products in the HVAC, fire/life safety, electrical, and plumbing systems engineering market. These products continue to innovate and raise the bar for the industry. The winner is voted on by industry professionals. “We are excited that our new symbol library is being recognized as an innovative product. We are always looking to raise the standard in our industry,” said Dan McCarty, owner of QA Graphics, when asked about the nomination. The Symbol Library v5 includes a variety of graphics and animations needed to construct building automation system graphics and HVAC graphics or MEP equipment. Almost any system graphic can be created, static or animated graphics, as QA Graphics symbol library is compatible with more than 95% of all major mechanical systems. Our custom designed graphics and 3D animations symbols include boilers, chillers, dampers, filters, piping, fans, cooling towers, generators, valves, ductwork, coils and more.